I have the best hubby in the world. After about two months of my not-so-subtle hinting that I was dying for a sous-vide machine of my own (love you, Richard Blais! 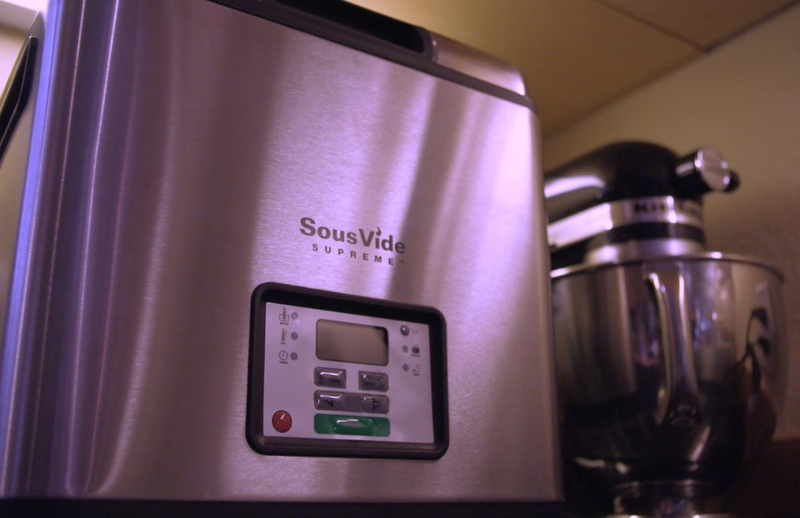 ), my lovely husband hooked me up with the oh-so-gorgeous SousVide Supreme. Plus, my wonderful mom and dad completed the package with a counter-top vacuum sealer. Behold. 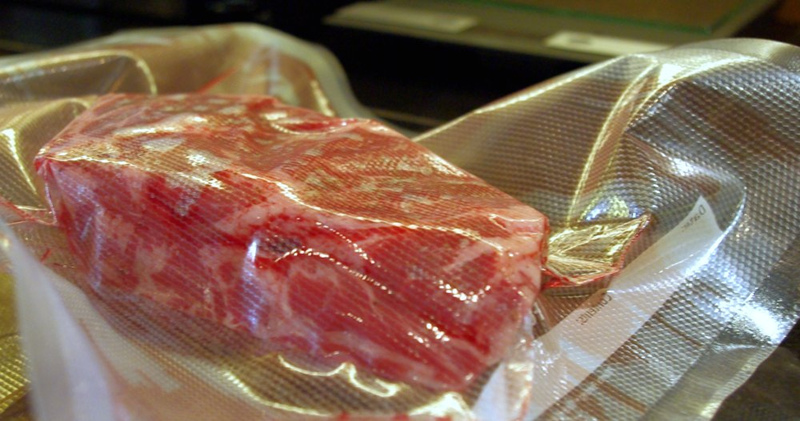 Cooking sous-vide (or “under-vacuum”), is method of cooking wherein food is vacuum-sealed in plastic bags and then dunked in a (precise!) temperature-controlled water bath for extended periods. This method allows you to cook food at the exact temperate at which you’d like it to end up (i.e. 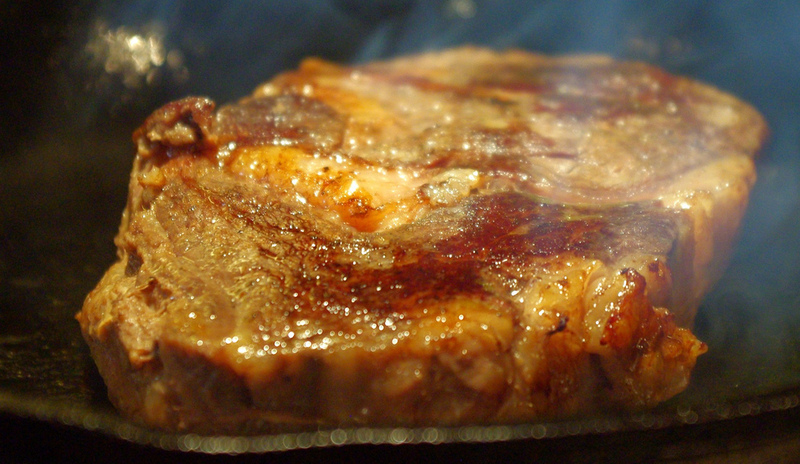 134 degrees F for a medium-rare ribeye). Because of the slow cooking time and constant temperature, foods are cooked evenly all the way through to a precise level of “doneness.” Foods, such as animal proteins, can then be finished with a pan sear or kitchen torch to give it that additional flavor and texture that we all love. More about my first sous-vide experiment after the jump! I’m beyond excited to start experimenting with this new toy… I did try my first ribeye the other night, and I have to say it was ridiculously easy to prepare. As it turns out, though, 134 may be a little on the rare side for me for that particular cut… when I try it again, I’ll probably bump it up to 136/137 and see how it looks. That said, it tasted gorgeous! I’ll post instructions when I’ve nailed it down just a little better. 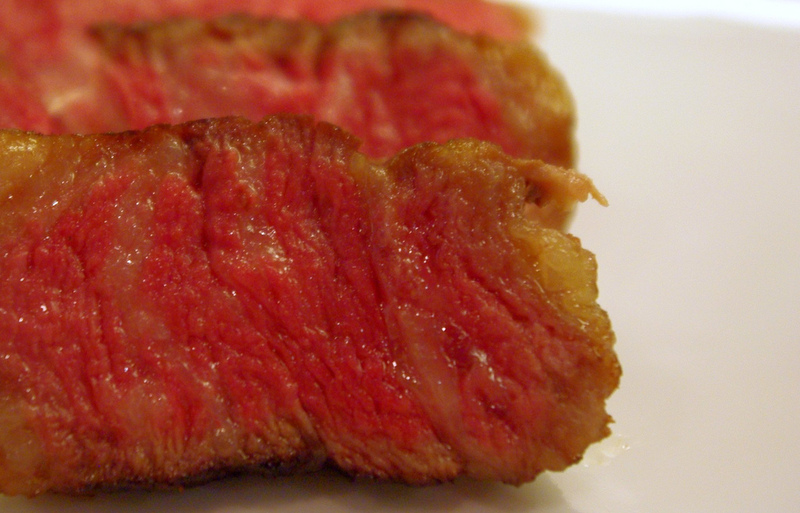 For now, here are some pics of my first-ever sous-vide experiment. Sliced ribeye with beautiful fatty bits. Yum! Sliced Steak Ready for Dinner!